Just after midnight on September 28th, 1994, the passenger ferry MS Estonia sank in the Baltic Sea. It was sailing its regular route, from Tallinn in Estonia to the Swedish capital Stockholm. The vessel capsized and sank in less than an hour, in the end settling sideways on the ocean floor at 80 meters deep. The weather was rough, but nothing extraordinary for the time of year, with winds of 25 meters/second and waves of 4 to 6 meters. Of the 989 passengers and crew, 852 died, making it the biggest European maritime disaster since WW2. 501 of the dead were Swedes. Just hours after the sinking, Swedish Prime Minister Carl Bildt was quick to try to control the narrative of what had happened. In a statement to the public, he announced that the sinking happened because the bow visor (the front part protecting the bow of the ship, which can be lifted up to allow the car ramp to be extended), had fallen off due to being pounded by the waves. The same afternoon Bildt called the Swedish minister responsible for maritime affairs, saying the same thing, ‘There are no other explanations’. And he called Hans Laidwa from the Estline shipping agency, the owner of MS Estonia, telling him ‘The accident must have been caused by a construction error’. A Joint Accident Investigation Commission (JAIC) was created the day after. The investigation quickly came to a preliminary conclusion only 18 days later: The bow visor fell off due to high waves and faulty locks, water flooded the car deck, the ferry became unstable, capsized and sank. That was also the commission’s final conclusion three years later. As basis for this conclusion, JAIC pointed to several things. The bow visor was found one sea mile from the wreck. The wreck was examined and filmed by a diving team, finding clues that supported this conclusion. But this hypothesis, which was so heavily promoted by the PM, decided how the investigation progressed. Information that didn’t fit didn’t get collected. The investigation started with a curious lack of interest in exploring other possibilities. Questions were left unanswered, theories not explored. It also influenced the technical investigation: Only the front part of the vessel was filmed, while the back part was not examined. The questioning of the survivors was haphazard and the team mostly asked questions that would support this theory. Important information was lost forever. A political decision was made not to raise the ferry. Technically, a salvage is feasible, and is a fairly common procedure in maritime investigations. When the ferry MS Herald of Free Enterprise sank in the English Channel in 1987, it was refloated and the bodies removed. A thorough examination of the MS Estonia would have helped in construction of new ferries, where potential weaknesses would have been identified. In normal airplane investigations, every last bit of wreckage is collected. The reason given was that the salvage operation would be too expensive, several hundred million Swedish kronor. New information continuously questions the commission’s conclusions. Even during the inquiry, conflicting witness statements were consistently disregarded. The JAIC working theory was that the reason for the capsizing was that the bow doors were fully opened. But this was not observed by the only two surviving witnesses who were monitoring the bow. Two crew members, who watched the car ramp on a TV-monitor when the ferry started to capsize and sink, stated that it was not wholly open, but that water came in along the edges. Loud bangs were heard by passengers. The commission declares that these sounds must have come from when the bow visor came off. Another question left unanswered, was how water flowed from the car deck to the lower deck, which supposedly was sealed. If only the car deck was flooded, the ferry would probably, despite sloppy safety precautions, have been able to stay afloat. Prime Minister Bildt said Sweden would do everything possible to recover the bodies (and implied, not raising the ship). It was later known that this was on advice from Commander Emil Svensson. 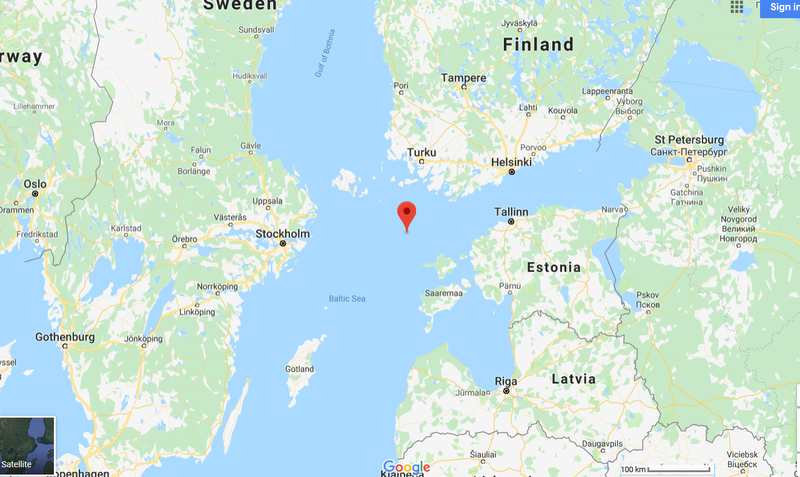 Both men have connections to the black op submarine hunt in the 1980ies, where supposed Soviet submarines over period of a decade continuously violated neutral Swedish territorial waters, leading to massive and well-publicized Swedish anti-submarine hunts. Bildt was a right wing MP fanning this hysteria. Cables released from WikiLeaks reveals that he in the 1970s gave confidential information from government negotiations to his contact in the US embassy. Svensson was the leader of the Swedish Naval Analysis Unit during the submarine hunts. Several years later, high ranking US and NATO senior officials, like former British navy minister, Sir Keith Speed, and Caspar Weinberger, former US Secretary of Defense, admitted that submarines from NATO-countries were responsible for these violations. The whole thing was a psychological operation, in cooperation with a right wing clique in the Swedish military. The exercise was designed to push Sweden closer to the NATO-camp and embarrass Social Democratic Prime Minister Olof Palme’s attempts to create a detente between East and West in the Cold War. The next (social democratic) government proposed burying the wreck in a sarcophagus, at a cost of several hundred million Swedish kronor. Entombed for all eternity, the wreck would be covered in gravel, then with concrete mats. It would seal the graves, but also make future investigations impossible. The project got cancelled after furious protest from relatives of the deceased, as an undignified solution, but only after part of the gravel had been put in place, at a cost of 200 million Swedish kronor. At the time, there were plenty of rumours of contraband smuggling. A survivor saw military personnel close off the Tallinn terminal and load on two trucks at the last minute before departure. This clue could have been investigated by the commission, by thoroughly checking the vehicles in the ferry. But this was not done. The divers did not even enter the car deck. The 90s was a chaotic decade for Russia and the Baltic States. Everything was for sale, and everything was possible. The Soviet, now Russian, army was in the process of withdrawing from the Baltic, and a demoralized Russia was a bonanza for Western spies looking for military technology. During the Cold War, Sweden had often been used as a conduit between East and West, officially neutral, although heavily leaning towards the US/UK. The country has an influential military-industrial complex, often involved in shady deals to sell weapons around the world. Swedish intelligence cooperated closely with NATO in things such as code breaking, human intelligence and signal intelligence against the Soviet Union. Later, it became known that MS Estonia had been used for sensitive military transports, in fact only weeks before the incident. A whistleblower working in the Swedish customs later testified that several trucks were let through with no questions asked, on MS Estonia’s journeys the 14th and 20th of September, just one and two weeks before the incident. People who might have had something to say, died. A former Estonian customs official, Igor Kristopovitsch, who now ran company dealing with sensitive transports, including on the MS Estonia, was shot on the October 22nd, four weeks after incident. Later, an Estonian inquiry, found that the material smuggled on the 14th and 20th of September was analyzed by Sweden’s Forsvarets Radioanstalt, their military signal intelligence unit, making it likely that the material was advanced Soviet materials, maybe connected to nuclear or satellite guidance. Sören Lindman, Swedish consul in Riga at the time, and also formerly in military intelligence, gave his opinion, that «people in Swedish intelligence helped foreign intelligence get material from Russia via Sweden to a third country. If it is UK or US, I won’t speculate. » As a reward for helping the transit, Sweden got to have a peek at the goods. Ingrid Sandquist, then leader of the customs department at Arlanda airport in Stockholm, later told of a mystery plane loading cartons just a few days after MS Estonia sank. Certain defense shipments can be left out of normal customs clearing if necessary, but she found the plane odd, even though her superior officers showed particular interest to make sure everything went smoothly. She chose to ask them about the plane, and they, on their own initiative, pointed out that it had nothing to do with MS Estonia, a statement that she found unusual. Several inquiries were later made. The Hirschfeld inquiry in 2005 was to investigate if the Swedish military was involved in smuggling of weapons on the MS Estonia. The result were as expected, Hirschfeld stated in his brief report that ‘nothing has been found that made him presume’ that anything was smuggled. But to be noted, he destroyed all his investigative material and papers, making future evaluations of his work impossible. An inquiry was finished in 2008 to see if the conclusion from the original commission was correct. Using drawings of the ferry and data simulations – but not investigating the wreck itself – it came to the conclusion that the original commission was correct, and that there were no further holes in the hull. Did the clandestine cargo contribute directly to the accident? It would explain the secrecy, the disinterested commission and the haste to draw conclusions. Several hypotheses are possible, from the relatively innocuous to the directly disconcerting. Maybe the ferry did lose its bow, but the sensitive cargo made it important to hide certain facts. Or the cargo contained explosives which blew a hole in the hull. If that was the case, it would explain why the commission wasn’t particularly interested in looking for other holes in the ship. It would certainly also destroy careers and the country’s reputation if revealed. At the time of the incident, conservative Prime Minster Bildt had just lost the election on September 18th and was still in the interim period before Social Democrat Ingvar Carlsson would take over a few weeks later. Bildt has a high interest and involvement in security and intelligence questions. Was the government hurrying to finish these transports before Carlson took over, and did Bildt have personal knowledge of the transports? The veteran journalist Lars Borgnäs, in his book Nationens Interesse, tells of an even more sinister explanation. He got a call from a man who claimed he worked in military intelligence. The man didn’t want to identify himself, but Borgnäs finds the conversation interesting enough to include in his book. He had by mistake seen a classified report from Must, the Swedish military intelligence service. To sum up what he saw: The smuggling operation had to be aborted because they feared customs were waiting for them in Sweden. The smugglers tried to open the bow to drive the trucks out, but failed. A decision was made to instead sink MS Estonia with torpedoes. Noise transmitters were put out to hinder recording of what happened, but the Swedish navy recorded everything on their underwater microphones. The submarine in question would be from a NATO-country. The wreck site is classified as a graveyard, and it is illegal to dive there. Nevertheless, adiving expedition led by Jutta Rabe took samples from the hull and had them chemically analyzed at several laboratories. «The results show changes to the metal similar to those seen by high-detonation velocity,» one report concluded. We will probably never know what really happened to MS Estonia. The cover-up has been successful. Even though one suspects that something is not right, the intelligence services and the military are generally good at keeping secrets. If something other than the official conclusion happened, the ones responsible will die in their beds as old and respected men, taking their story with them. MS Estonia is not a unique case. Keep her in mind next time you see any official inquiry. If military or intelligence services (US, NATO, Swedish or any other) have a stake in the case, chances are you will not hear the truth. I’m reminded of the El Al cargo plane that crashed into an Amsterdam tower block in 1992, carrying weapons grade chemicals (some say sarin) for Dimona, Israel. It was all covered-up, of course. According to the authorities the plane only carried “flowers and perfume”. They might as well have included pink unicorns. More on the subject on this site. Confirms what I’ve been thinking ever since the stitchup of Assange and the Peace Prize to Obomba. There’s something rotten in the state of Scandiwegia. The Swedish police never made any serious attempt to investigate the assassination of Palme either. Carl Bildt is a CIA asset, currently with his snout in the trough of efforts to loot whatever is left to loot in Ukraine. Mikaelvuo, I stopped reading your Link at this point because the Swedish expert (without saying so explicitly) puts a finger on the most dodgy connection in that very dodgy country, Sweden since the assassination of prime minister Palme. “The voice ys the voice of Bildt but the hand is the hand of Cheney”. Halliburton is a Cheney company. People are starting to see conspiracies everywhere now: relax, there were some but some other situations were real accidents (Murphy law cases). The next (social democratic) government proposed burying the wreck in a sarcophagus, at a cost of several hundred million Swedish kronor. Entombed for all eternity, the wreck would be covered in gravel, then with concrete mats. It would seal the graves, but also make future investigations impossible. This shows that the right wing – left wing labelling is useless: better use freedom protecting vs freedom curbing. Freedom means different things to different interests. In fact no word is used more often to justify the tyranny of class rule than freedom’ we have ‘freedom to work’ laws which are designed to prevent workers from freely assembling and bargaining collectively and ‘freedom of enterprise’ which protects capitalists from democratic oversight. Suit yourself; for me left-right has become useless, except for traffic directions. Freedom (for the general population obviously – but you knew that ) is for me much clearer. Example: Snowden’s whistle blowing was helping this freedom for all against anti forces fostered under Democrats as well as Conservatives and Labour (Blair) as well as Tories (May). Was Hitler’s national-socialism right or left? Were Stalin’s purges left or right? Using freedom for all sorts all these cases out immediately. Like your beloved ‘freedom protecting’ Zionazi regime, eh Antonyl. Ask any Palestinian. Ask any Mainland or Taiwan Chinese, or any minority in a Muslim majority country. We are witnessing the totalitarianism of mainly fascist governments. However, the unDemocratic party, apparently liberal, has also become a fan of totalitarianism with their neo-Bolshevik “Antifa” running riot in both the real and virtual world. Wasn’t there some ‘War Games’ involving warships from Nato at the time? As far as I know, the military exercise was on the other (west) side of Sweden, so a fair bit away. When I researched this article, a fair bit of information that I am certain I previously read a few years ago online seems to have been lost down the memory hole, including details on these military activities. Previous PostThe 9/11 anniversary: Conspiracy theory or critical thinking? Next Post“Chepiga” and “Boshirov” – what does Bellingcat actually tell us?